Join us on a guided tour of the farm and parkland on our fleet of off-road Segway - the most adventurous course in Dumfries & Galloway. Tour includes introductory session in our safe and soft training area, then head out with your guide to explore the landscape. You'll glide though our Glampsite, across fields and meadows around fishing lakes, past rocky crags and see our nature area, plus you'll enjoy free riding time in our interesting and undulating skills field. We can take groups of up to four riders. Booking is essential.
" Thank you for a great morning on the Segways on Saturday. We all had a fab time in the end despite some reticence from the kids"
" Thanks - great fun and we all really enjoyed it. We will be back!" " Hi, just wanted to say thanks so much for today, we really enjoyed our Segway tour. Looking forward to receiving the photo. Many thanks"
1 hour - but plan to arrive 10 minutes prior to your designated time. You'll receive a comprehensive safety briefing covering the operation of your Segway. We provide helmets, gloves, elbow and knee protectors. 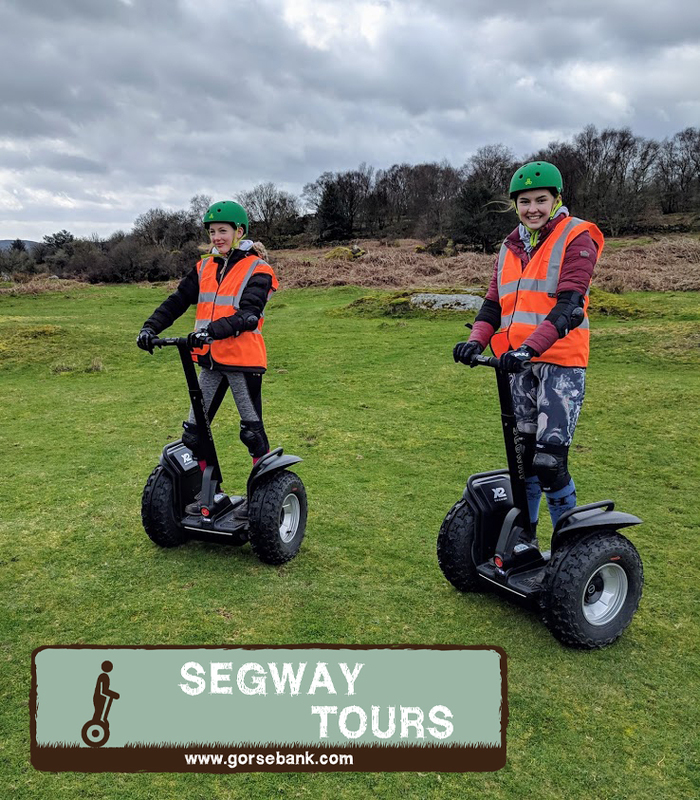 It's your weight that determines if Segways are suitable, but you need to be 10 years or older (under 16's must be accompanied by an adult). We suggest wearing outdoor clothes and bring waterproofs if it has recently rained or if rain is forecast. You can book your Segway Tour @ Gorsebank, either online (click below), call us on 01556 610174 or email active@gorsebank.com. If you are staying with us and want to Segway, book your tour with your accommodation and SAVE £5 per rider. We are open all year, 7 days a week and run tours morning, afternoon and by special arrangement, evenings (Spring and Summer only). Click here to see our Segway Tour Terms & Conditions.